THE biggest sale of the year is HERE! 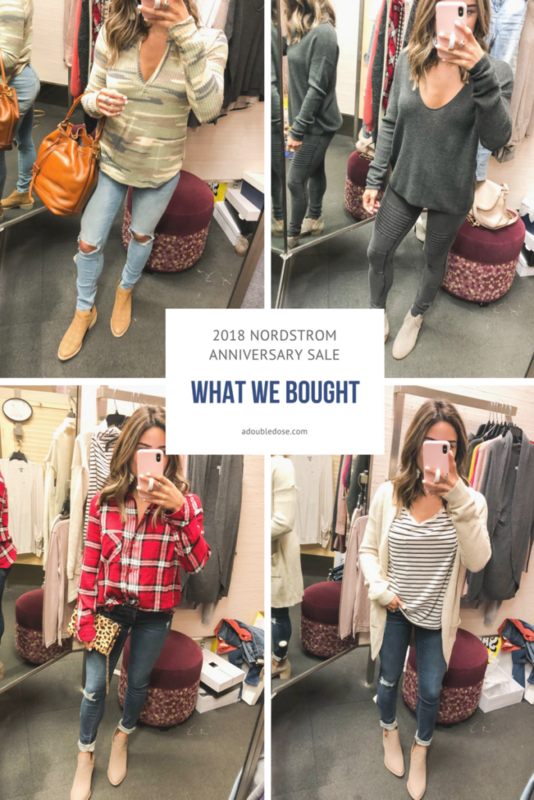 We shopped the entire Nordstrom Anniversary Sale in-store yesterday for you all to find the best pieces to share! Most of the items are all under $100. Such great stuff!! Be sure to check out this post for more info on the sale! 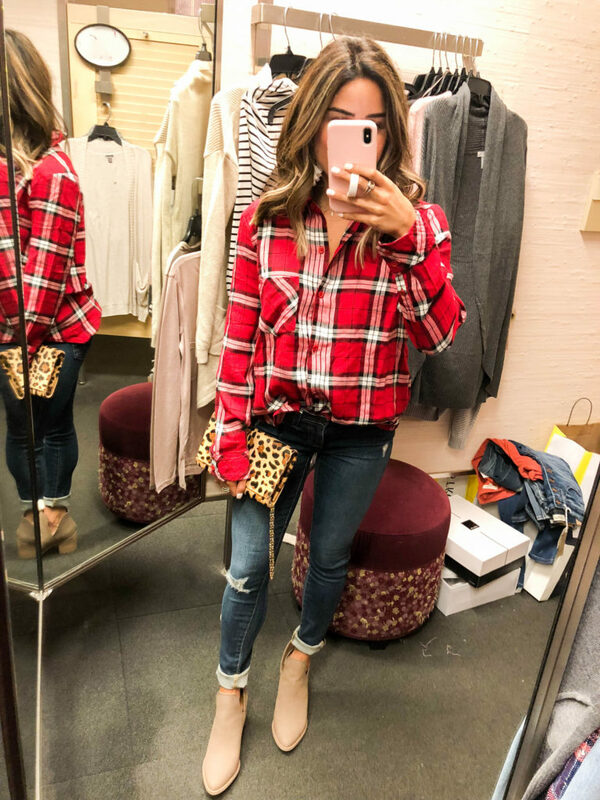 PLAID SHIRT: SIZE XS – We ALWAYS go for a plaid top, and this one is a great basic! BOOTIES: SIZE 6.5 – These are pointed toe and super flattering and make your legs look so much longer! 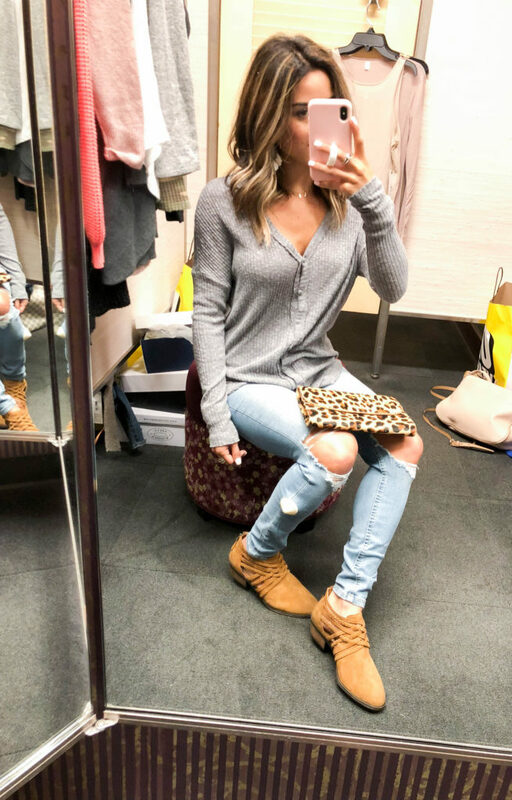 GREY SWEATER: SIZE XS – super soft and cozy! 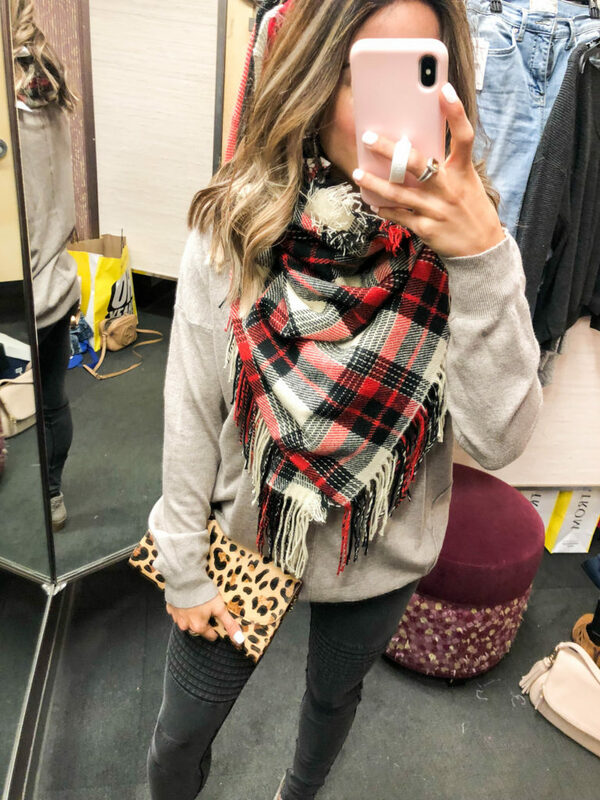 PLAID SCARF: can’t beat a plaid scarf! LEOPARD CLUTCH: this bag is just a must and goes with everything GREY SWEATER: SIZE XS – super soft and cozy! BOOTIES: SIZE 7 – these have the perfect cutout on the side, super comfy, and come in 3 colors! DARK GREY THERMAL: SIZE XS -This one comes in several colors, but obviously can’t beat the grey! GREY CASHMERE VEST: SIZE XS/S – This one is SO great for fall/winter. You can wear it with so many things like leggings, jeans, dresses. LONG SLEEVE TEE: SIZE XS— This tee sold out immediately last year, so get it while you can! RIPPED JEANS: SIZE 25 – have these in a different wash and wear them all of the time. Super stretchy and comfy and perfect rips. They’re also a little higher waisted. GREY THERMAL: SIZE XS – Fits so well and not too heavy! RIPPED JEANS: SIZE 25– have these in a different wash and wear them all of the time. Super stretchy and comfy and perfect rips. They’re also a little higher waisted. BOOTIES: SIZE 7 – these come in a bunch of colors and have the cutest braid detailing! BLUE BLOUSE: SIZE XS – Got this one in black, too! Can be dressed up or down! GREY DRAPEY TOP: SIZE XS – This top is AMAZING. SOFTEST thing E V E R! And, you can convert it several ways! 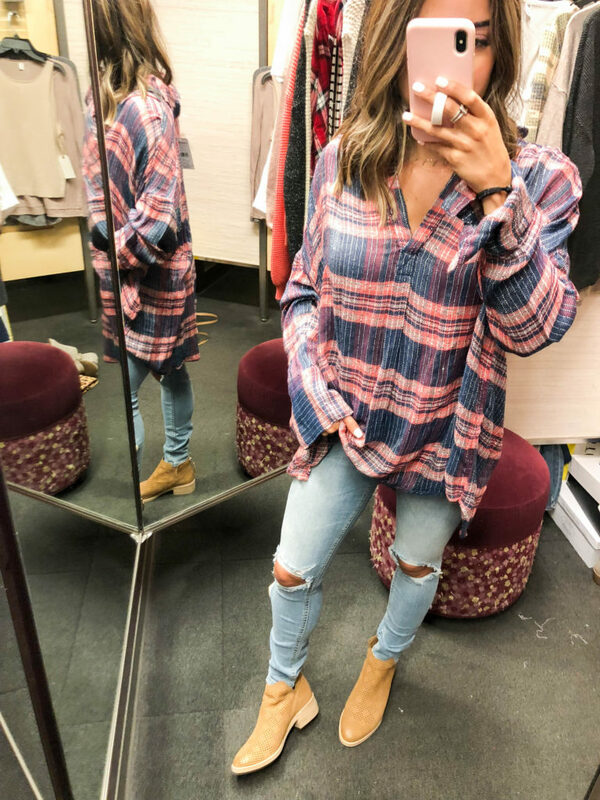 PLAID BLOUSE: SIZE XS – This one is more oversized, and would be super cute with leggings! BOOTIES: SIZE 7 – These have perforation in them, and are so comfy! Also, more pointed in the toe, which is flattering! 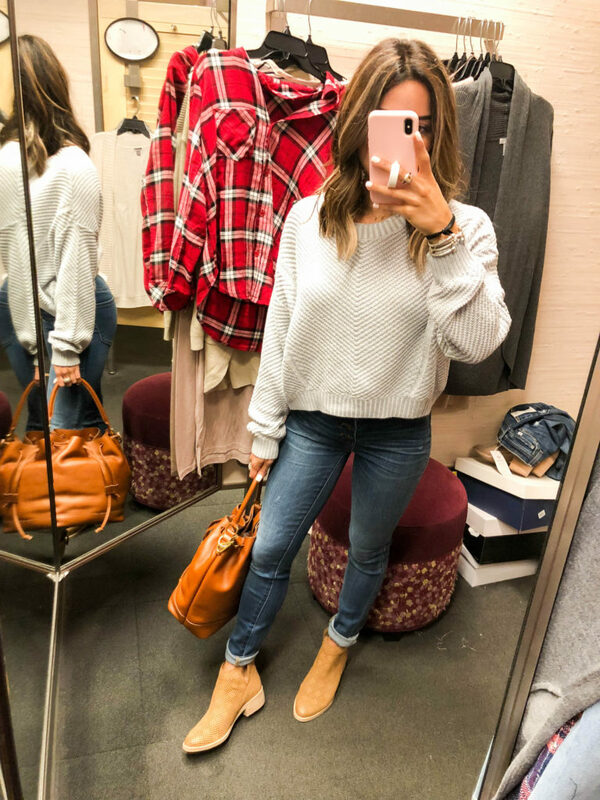 GREY SWEATER: SIZE XS – so soft and cozy! Has ribbing and pouffier sleeves! BOOTIES: SIZE 7 – these come in a bunch of colors and have the cutest braid detailing! GREY SIDE SLIT SWEATER: SIZE XS – Love the side slit on this one. Fits perfectly, and could be worn with skirts or black pants for work! BOOTIES: SIZE 7 – These have perforation in them, and are so comfy! Also, more pointed in the toe, which is flattering! 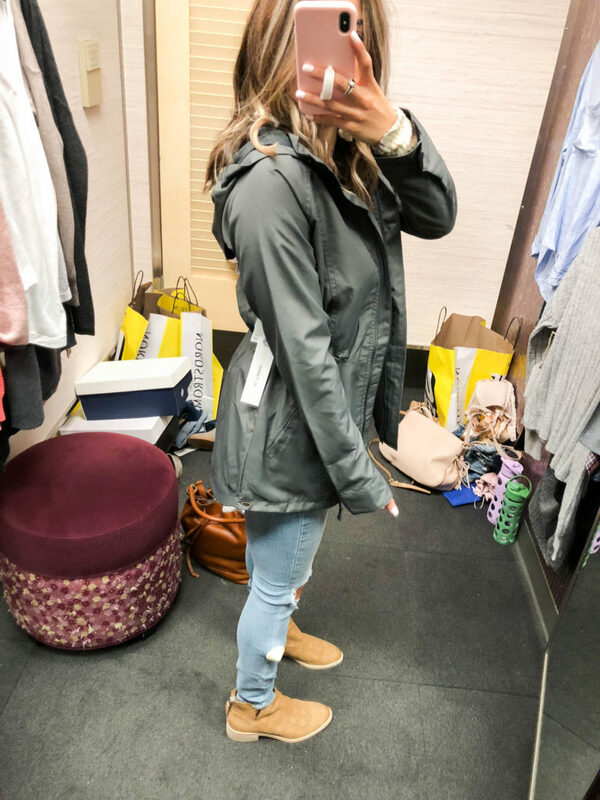 RAINJACKET: SIZE XS – this rain jacket is not only super versatile, but also flattering and more fitted! It has a hood and it cinches at the waist! CAMO THERMAL: SIZE XS – You all know we love anything camo! This thermal run small, FYI! 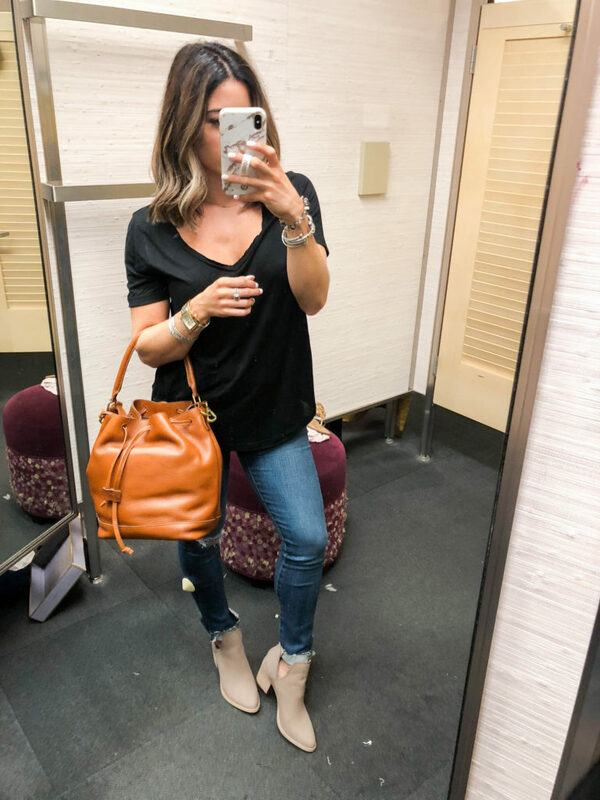 COGNAC BUCKET BAG: super cute bag for summer and fall! Fits a lot and a great color! WHITE TEE: SIZE XS – Can’t beat a white tee! Great buy! 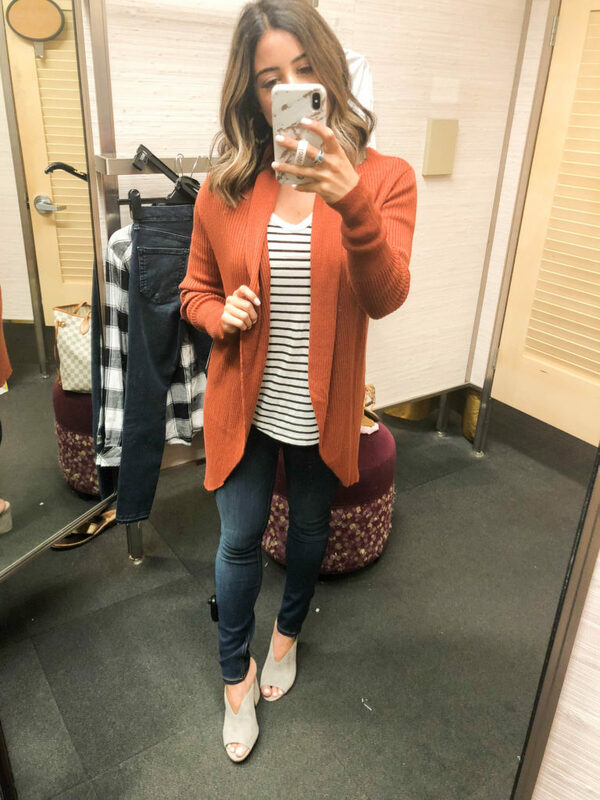 GREY CARDIGAN: SIZE XXS– We got an almost identical cardigan last year, and wore it all of the time. This one will sell out super quickly, so snag it asap! GREY SUEDE MULES: SIZE 7 – How fun are these?! They can be worn with jeans, skirts, dresses and are a perfect heel height! WHITE TEE: SIZE XS – Can’t beat a white tee! Great buy! – Can’t beat a white tee! Great buy! BLUSH CARDIGAN: SIZE XS– Super soft cardigan and the color is amazing!! 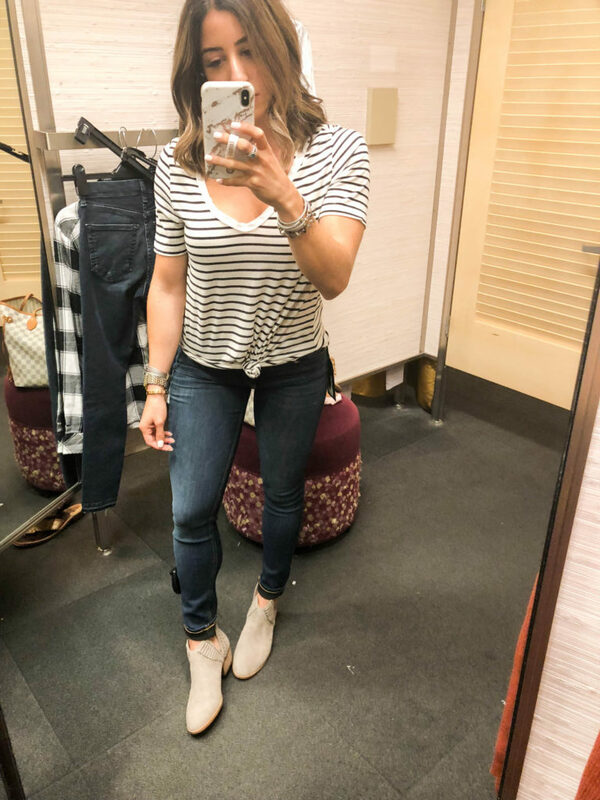 DARK JEANS: SIZE 25 – These are another pair worth splurging on! They are so stretchy and fit like a glove! Size up in these! PINK THERMAL: SIZE XS – Same one we shared in grey above! The pink is just too fun! BLACK BLOUSE: SIZE XS – Same blouse as in baby blue above. Great for everyday, or work! CORAL TWISTED WAFFLE KNIT SWEATER: SIZE XS – combines the best of both worlds: twisted and bright! RUST OPEN BACK TOP: SIZE XS – Had to show you all the back! Not too open, but so cute! Also comes in cream. 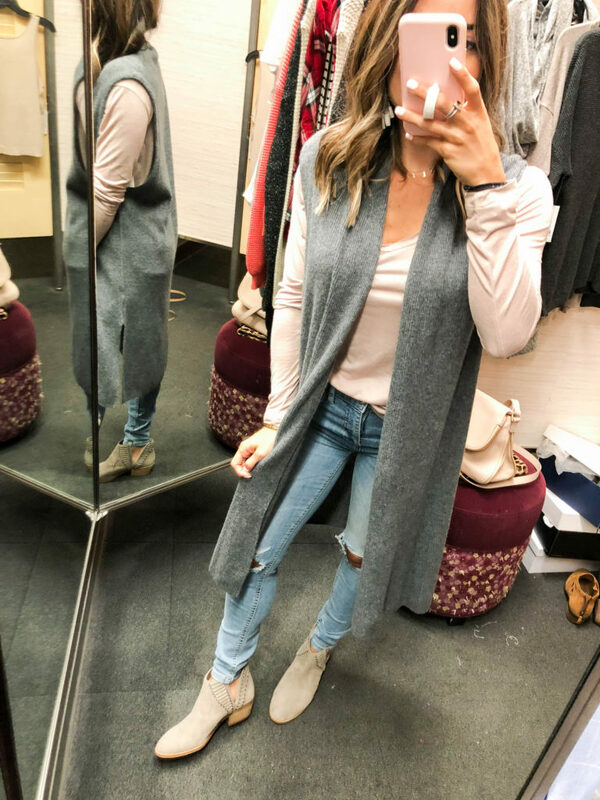 GREY HOODED CARDIGAN: SIZE XS – OMG this sweater is amazingly soft and just the right amount of thickness! 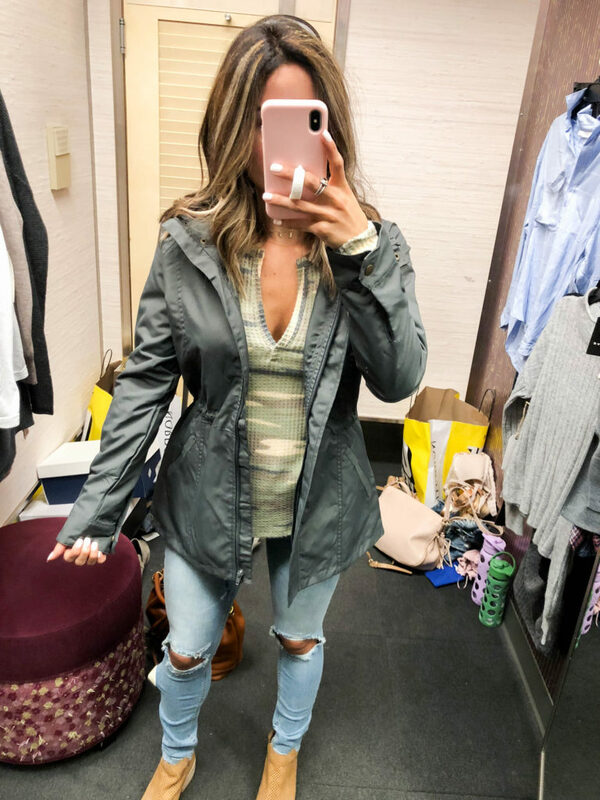 RIPPED JEANS: SIZE 25 – These are a great price point and they have the perfect amount of rips! CREAM LACE CAMI: SIZE XS – great basic cami for layering! 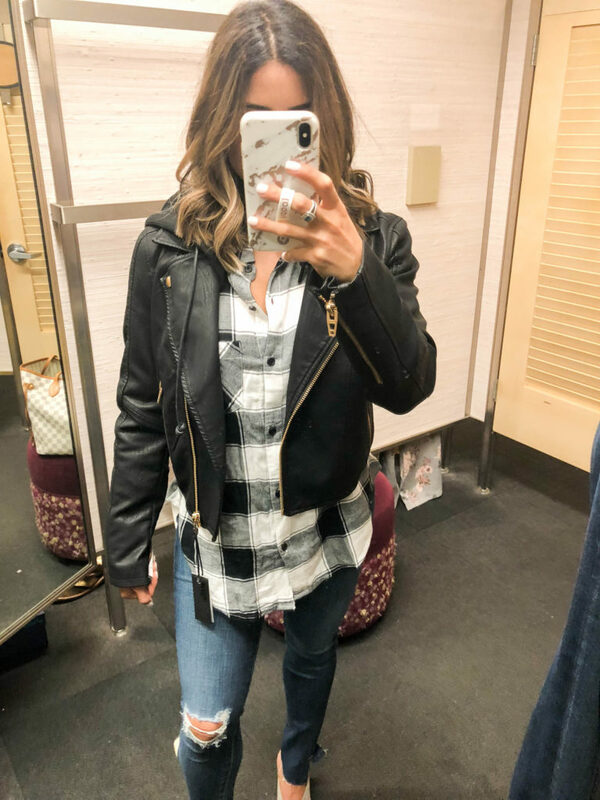 BLACK MOTO JACKET: SIZE 34/US2 – This jacket is amazeballs! Such a steal!! RUST CARDIGAN: SIZE XXS – Another great cardigan. This one is a great color! JEANS: SIZE 23 – These run big and are higher waisted! CREAM LACE CAMI: SIZE XS– great basic cami for layering! CREAM THERMAL: SIZE XS – Great basic layering top. This one will be great for fall and winter. BLUSH FOLDOVER BAG: Such a great bag. Super comfy to carry and can be worn cross-body. GREY KNIT SWEATER: SIZE XS – love the texture on this sweater and it is a little cropped, but not too much! COGNAC BUCKET BAG:super cute bag for summer and fall! Fits a lot and a great color! STRIPE LONG SLEEVE TEE: SIZE XS– This tee sold out immediately last year, so get it while you can! 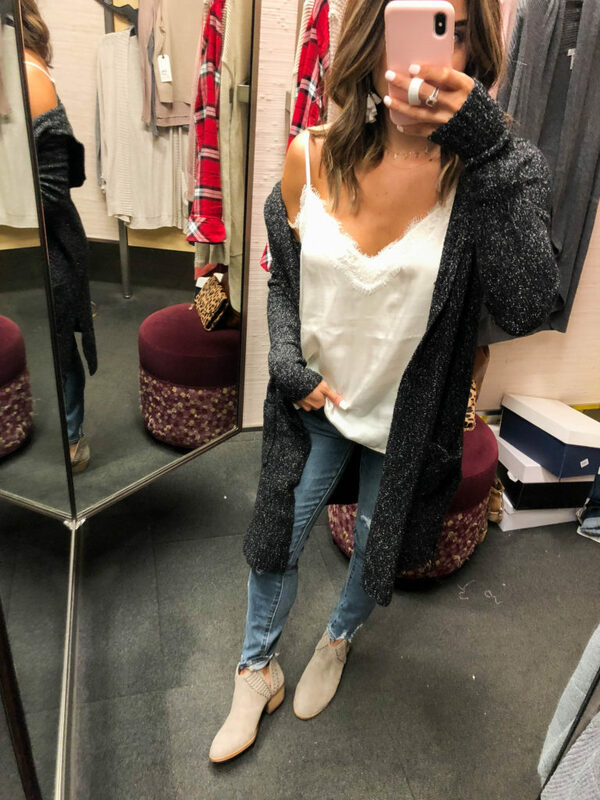 CREAM CARDIGAN: SIZE XXS- Neutral cardigan for the win! 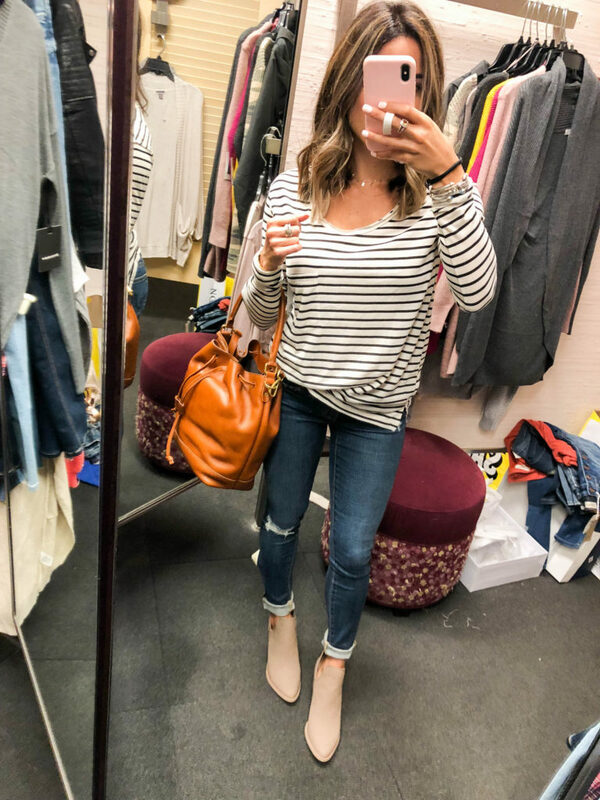 STRIPE LONG SLEEVE TEE: SIZE XS— This tee sold out immediately last year, so get it while you can! 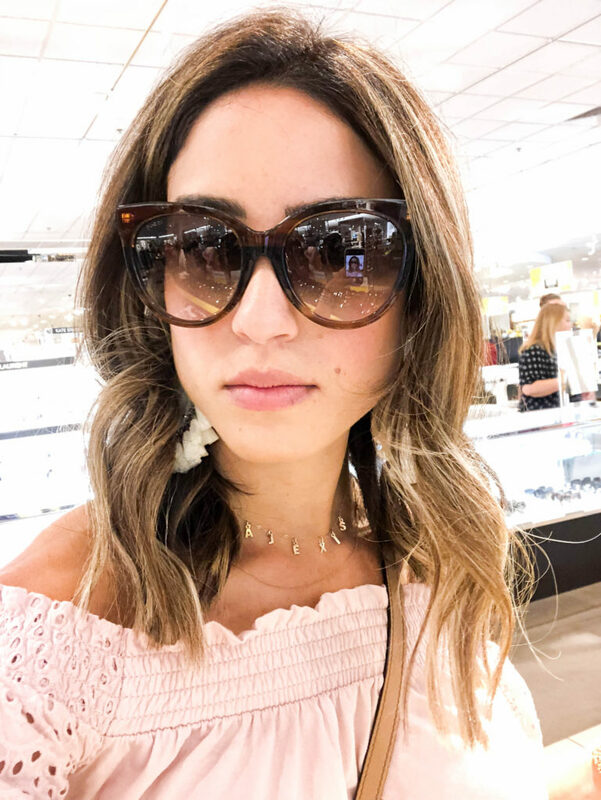 PRADA SUNNIES: These are a GREAT buy, especially if you’re looking for a designer pair! Love the shape and color! DRESS: SIZE XS -runs small—cute dressed up or down! 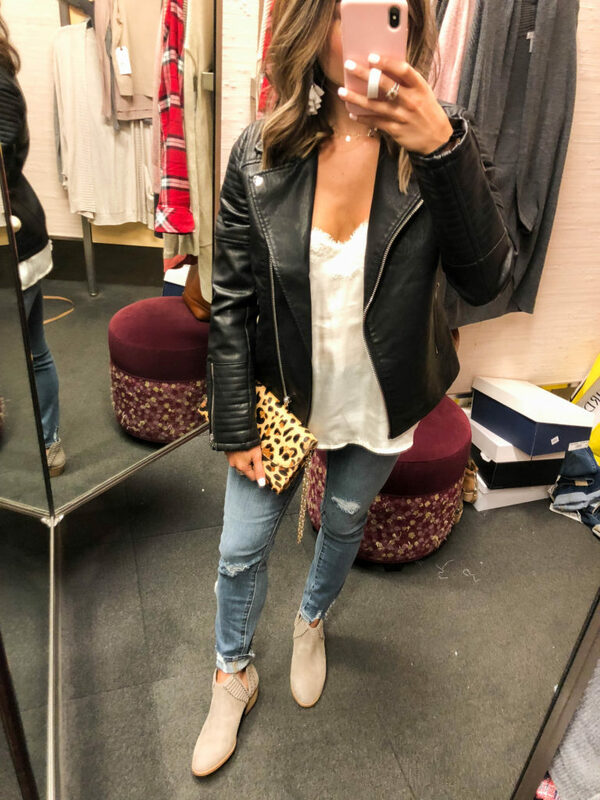 BOOTIES: SIZE 6.5 – love these with skirts, dresses, jeans—so cute with the neutral color and cutout! BLACK TEE: SIZE XS — fave tee—comes in lots of colors! MULES: SIZE 7 – love these with skirts, dresses, jeans! YELLOW WAFFLE TEE: SIZE XS — comes in lots of colors! TWISTED WAFFLE KNIT SWEATER: SIZE XS — such a cute detail with skirts too! BLACK TUNIC: SIZE XS — such a great basic! GREY THERMAL TEE: SIZE XS — super soft! CAMI: SIZE XS —great for layering/ date night! WHITE TEE: SIZE XS —great for layering! BELTED CARDIGAN: SIZE XS —love the sleeve/belt detail! PINK CARDIGAN: SIZE XS – super soft and cozy! BLACK TEE: SIZE XS SIZE XS – great for layering! RUST CARDIGAN: SIZE XS – super soft and cozy! BLACK TEE: SIZE XS – great for layering! Thanks for shopping with us! We will have TONS of Instagram and blog posts with more sale picks so be on the lookout! As always, let us know if you have any questions at all! HAPPY SHOPPING!